This Sunday: "Live With Purpose, Party With A Cause"
Obo Addy alone is worth the ticket price to get into this super-cool benefit concert and fundraiser. Throw in David Bowers, killer auction items and raffle prizes and it's an amazing deal. Then consider that for the cost of a pizza, you can have a direct, positive impact on the lives of 10 desperately poor orphan kids. Now you're truly partying with a cause! Get tix @ Thump Coffee and Douglas Jewelry downtown Bend on Minnesota. ART: Mark Bernahl's "Altered Books" and Artists Local 101's "Altered Stations"
Local artist Mark Bernahl displays his "Altered Books" this month. "I started sculpting into books partly because I am color blind and this limited the type of art I can make," Berhahl explains. "Plus, I always strive for making art that is beautiful and unique." Bernahl says it takes him approximately a week to carve one of his book sculptures. 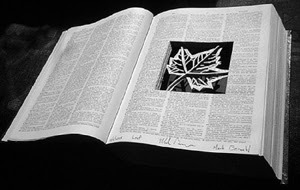 He chooses the images he carves from the title or the pages in the book. "When I see any book the first thing that comes to my mind is what sculpture is already in it, and can I get it out." Bernahl's "Wishes" installation has become a fixture at the downtown Bend coffeehouse, and continues to hang from the ceiling because it has been so well received. "When I started making art I could not afford traditional art materials and framing my art was not an option," says Bernahl. "So I started making art that did not have to be framed. This led me to making art in non traditional ways." Before moving to Bend eight years ago, Bernahl studied architecture in Colorado and Illinois. He is actively involved in Artists Local 101 and recently presented a seminar, "Artist Portfolio on the Web," at the Deschutes County Public Library in Bend. ART: Artists Local 101's "Altered Stations"
Artists Local 101 is a "hard-working band of art rebels dedicated to instigating and promoting contemporary and outsider art in Central Oregon, taking art out into the streets, and providing opportunities for artists and the community to experience art in the everyday." will have at least one of them here, as well as maps for self-guided tours of the other works. Read more about Artists Local 101. "Taste can be a very fleeting sensation, and in the span of microseconds many flavors will wash across the palate at the same time. The challenge is to become skilled at noticing, identifying, and describing those flavor sensations in a way that is meaningful to you. 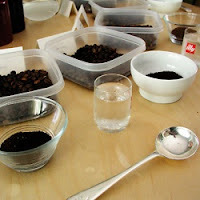 "A wide range of vocabulary can be used to describe the tastes found in coffee. Descriptors range from the familiar (chocolatey, sweet, fruity) to the conceptual (clean, vibrant, sturdy) to the wildly esoteric (summery, racy, gentlemanly). I've heard coffees compared to Kevin Costner, Honda Accords, and cold winter nights. "What matters is that the description is purposeful and attempts to communicate the essential nature of the coffee using language that people can relate to. Taste can be a very personal experience, and memories of tastes that you've experienced in the past form the background against which new tastes are evaluated and understood." thump coffee is located at 25 NW Minnesota Ave. in downtown Bend. Please visit thumpcoffee.com or call 388-0226. EVENT DATE/TIME: October 30, 3:30-4:40 p.m.
(Bend, OR) Students from Louise Markland’s Bend High School Culinary Arts program will donate their time and skills to prepare meals for fellow students in need. Working in the Entrees Made Easy kitchen and using fresh ingredients donated by the business, students will assemble ready-to-cook meals for the local Family Access Network (FAN) program. Brenda Rachels, FAN advocate for Bend High and Mountain View High students, will help deliver the meals to students and their families who need this vital community support. FAN works within our local schools — the Bend-LaPine, Redmond and Sisters districts — to link children and families to critical support, such as nutritious meals, dental work, job opportunities, clothing, rent assistance, childcare support, health insurance, or whatever the child needs. Entrees Made Easy recently launched a year-long effort to ‘adopt’ 10 children each month by donating the funds necessary to fund FAN advocates for them. A FAN advocate can provide services to one student for an entire year for just $100. According to FAN program director Julie Lyche, FAN especially needs community support right now because of reduced funding and a growing school population. Last year, the Bend High Culinary Team won the National Culinary Management Championships. Six students from the Culinary Arts program, 16- and 17-year-olds, volunteered for the meal preparation project. 1. Think positively, not negatively. 2. Accept structure but know that it is to be questioned and broken when necessary. 3. Always be willing to explore, experiment and invent. Do not accept the status quo. 4. Know yourself and keep your work consistent with who you are and how you think. 5. Maintain good moral and social values. 6. Be humble, honest, compassionate, and egalitarian. 7. Have conviction about your work. 8. Be open and say yes to most ideas and requests. The good ones will be valuable, the bad ones will cease to exist. 9. Allow employees and fellow workers freedom and the ability to work to their strengths. Avoid hierarchy. 10. Money should be the residual of work, not the goal. But do not compromise your worth. There's something magical about a great portrait. It takes a keen eye and superb artistic vision to create one that rises above the mundane. From the Dutch masters' oil paintings to Annie Liebowitz's celebrity photographs, the most arresting people-pictures capture something of the essence of the individual and their personality. A simple gesture, a moment of completely candid emotion, a setting, an object, an article of clothing - small details bring portraiture to life. I'm currently collaborating with Carlos Perez at Perez design on a website update for Bend-based photographer Carol Sternkopf. Carol is a truly gifted portrait photographer. Her formal fine arts training in drawing shines through the lens of 20 years experience as a pro shooter. Of course, Carol shoots more than portraits - fine art photography, photo illustration and editorial work are well represented in her portfolio. And it all glimmers with the touch of an artist's hand. Now, if I can help convey some of that magic in the website . 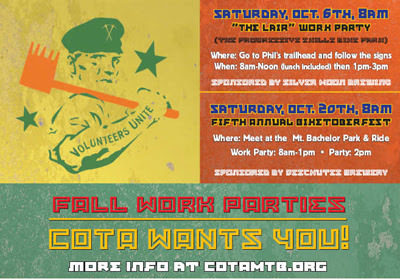 . .
Biketoberfest - our big annual trailwork day is this Saturday the 20th. Meet at: 8AM Saturday 20th - Mt. Bachelor's Park and Ride on the corner of Simpson and Columbia Avenues. Bring: Yourself and your riding buddies. A hydration pack with water and a few snacks. Eye protection (riding glasses), gloves and sturdy footwear. Tools: COTA will provide the bulk of the tools. If you have your own trail work tool bring it. Party! COTA will host a post-work party at the park and ride with a BBQ and beverages for all the workers. The plan is to have all crews back at the Park and Ride by 2pm for the festivities. Mrazek: trail realignment and tread repair. Short hike. Upper Whoops: re-alignment and tread repair - 1/2 mile hike in. Storm King: a variety of projects including brush work. Driving to multiple work sites. Ben's Trail: re-alignment of user-built go-arounds. Slalom Play Loop: Buffing out this awesome zone. The Lair: Work continues on Oregon's newest freeride zone! Flagline: tread repair and new features. This will require bikes. Please send an email to: lissettenz(at)yahoo.com to confirm a place with this crew. This crew is only for those who are dedicated - expect bad weather, hard work, and a possibly a longer day. Looking forward to another productive day putting our trails back together for the winter. See you there. 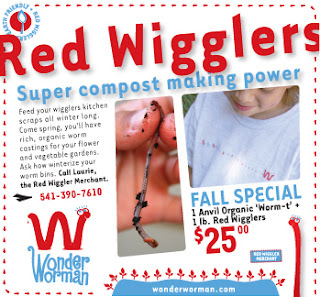 (Bend, OR) Nature's perfect little composting machine, the Red Wiggler earthworm, has been championed by a new green super hero, Wonder Worman. With the expert help of Wonder Worman and her trusty sidekicks, any citizen can now do his or her part to reduce landfill waste. Why throw away those kitchen scraps when Wonder Worman and her army of Red Wigglers can convert that trash into treasure? Start a worm bin now in your garage or greenhouse, and harness the super compost-making power of the Red Wigglers all winter long. Come spring, you'll have a bin full of rich, natural compost for flower or vegetable gardens. "Western Soundscapes is a searchable web-based audio archive with a focus on the natural sounds of the western United States. Currently in the pilot phase, the project includes more than 600 recordings of regional wildlife and ambient soundscapes. The archive is housed at the University of Utah's J. Willard Marriott Library and features recordings contributed by volunteers, state and federal agencies, and conservation groups." (Bend, OR) If you ride a mountain bike on Central Oregon's famed trails, then please do your part to support the Central Oregon Trail Alliance. They are the reason we enjoy one of the country's most extensive networks of trails. My son Blake Robert Hanford Cecil, the oldest of my two children, was born nine years ago this morning. My friend Mark Yaconelli told me when Blake was born that he would become my greatest teacher. He was right. 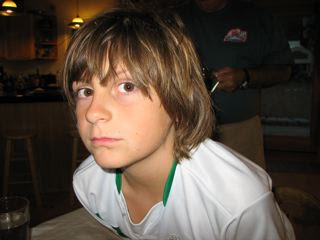 Everyday I learn lessons from my son - he's compassionate, intelligent, loving, sensitive and funny. I am truly blessed to have him in my life. (Tumalo, Ore) "Evening Aura," an oil painting by Lisa Copenhagen Wachs, was recently selected to be featured on the poster for "The Spirit of Our NW Forests" exhibit at the Central Oregon Community College Barber Library Rotunda Gallery. The exhibit, which honors the college's forestry program, focuses on the beauty of wood, wildlife and water within the forest environment. The works of more than 40 artists from Central Oregon, Eugene, Springfield and Seattle were selected. The exhibit includes works in stone, oil, watercolor, pastels, wood and bronze. "The Spirit of Our NW Forests" show was juried by local painter, Ken Roth, who studied under master Sebastian Capella. His paintings, which reflect his interest in nature, light and color, are shown in galleries throughout the West. Inspired by old-growth ponderosa and juniper on her property in Tumalo, "Evening Aura" is one of two Copenhagen Wachs oil paintings chosen by Roth for the exhibit. "The Spirit of Our Northwest Forests" exhibit will be displayed at the Library Rotunda Gallery through Oct. 25. For information, go to http://www.cocc.edu/News/21310.aspx or call 383-7564. Tumalo artist Lisa Wachs has been a fixture on the local art scene for more than a decade. She works as a self-employed graphic designer and fine artist and has worked and lived in Portland, Oregon, San Francisco and Taos, New Mexico before settling in the Bend area in 1992. Lisa paints primarily in oils and works in mixed media collage/assemblage. She works in her Tumalo studio, a renovated milking barn that overlooks the high desert landscape. The surrounding abundance of wildlife and nature in general, continue to be an inspiration for her artwork, which has sometimes been described as "Northwest Mystic" in style. NOTE: Please contact us for a print-quality photo of "Evening Aura." (BEND, OR) During October and November, The Jackalope Grill is serving a special three-course Oregon Bounty Prix Fixe Menu pairing fresh, local ingredients with Oregon wines. Oregon Bounty is a two-month celebration of Oregon's many culinary artisans and tasteful destinations. The Oregon Bounty dinner is $45, or $35 without wine. The first course consists of a field salad of gathered greens, Rogue blue cheese, roasted Oregon hazelnuts and Champagne-Pear Vinaigrette served with Chehalem Pinot Noir. The second course features grilled house-made German-style sausage, warm potato salad, pinot noir-braised red cabbage and Ingelhoffer mustard served withYamhill Pinot Noir. The third course finishes with Oregon pear tatin with a Maragas Muscat wine reduction and homemade vanilla ice cream paired with Maragas Muscat Canelli. (Bend, OR) Deschutes River Manufacturing has improved its widely used portable motorized fire hose roller, The Rookie Sidekick All-In-One (AIO). By simply moving two pins, the updated AIO instantly adjusts to roll hose of any diameter, from 1-1/2 to 7-1/4 inches. "We used the Rookie SideKick rollers during clean up duties last week and it was phenomenal," says Nancy Koerperich, division chief and director of fire training at the CAL FIRE Training Academy in Ione, near Sacramento, Calif. "A job that usually takes all day with a crew of six was cut down to four hours with a team of two. It was great." Center (NIFC) in Boise, Idaho, Bend (Ore.) Fire & Rescue, Pratt & Whitney Fire Department in East Hartford, Ct. and others. "To accommodate the needs of our industrial customers and larger municipal departments, we've improved The Rookie Sidekick All-In-One (AIO) to handle up to 7-1/4 diameter fire hose," explains David Johnston, owner of Deschutes River Manufacturing. "Even with these big, heavy hoses, a single firefighter can now quickly, safely and perfectly roll one hose length after another." The Rookie Sidekick AIO hose rollers and The Rookie Reloader re-decking system are available to put through the paces without obligation to buy through a 30-day trial program. All Sidekick models are equipped with either a Honda gas engine or Baldor electric motor. Larger electric models feature variable-speed controls. The Rookie Reloader is an optional re-loading rack that transforms the portable stand into an efficient hose handling system. The equipment allows firefighters to effortlessly transport rolled hoses and it reduces the labor needed to re-load hose back on to the engines. The Rookie products are OHSA-inspected. All products can be ordered directly from Deschutes River Manufacturing, and the original Rookie units are available through the GSA system (GSA orders do not qualify for the 30-day trial). For more information, visit www.the-rookie.com or call 541-480-5967 or toll free 877-868-1951. (Bend, OR) Rarely does a night of live world beat music and fine art in Bend directly improve the lives of desperately poor children living half a world away. "Live With Purpose, Party With A Cause," a fund raising event for locally based grassroots nonprofit Vima Lupwa Homes, promises to deliver on both. Sunday, October 28, at the Domino Room, master African drummer Obo Addy headlines an evening of music and art, a silent auction and raffles of cool schwag. Doors open and silent auction and raffle items will be available for viewing and bidding beginning at 6:00 pm, with music featuring local slide guitar wiz David Bowers beginning at 6:30 pm. Tickets are $20 in advance, $25 at the door. Proceeds from the evening go directly toward meeting and sustaining the daily basic needs of Zambian orphan children living in their new home, the Vima Lupwa Home. Ensuring the children's continued health, providing education and job skills, maintaining their garden and chickens for food as well as for income, providing bicycles for transportation and supporting their new bicycle repair business are all components of Vima Lupwa's plan to make the home self-sustaining over time. 21-year-old Central Oregon Community College student and Bend native, Malerie Pratt, founded Vima Lupwa Homes. "She's not one of those super-liberal weeping heart people that's all talk, no action," Joyce Boone, Pratt's high school English teacher, recently told The Bulletin. "She just believes in people and that's why I think she's been so successful. She thinks, 'What do they need and how can I get it to them?'" Live With Purpose, Party With A Cause is sponsored by the Sanders-Vega Family, Douglas Fine Jewelry Design, Tyler & Studebaker, Willis Builders, The Jackalope Grill and Kialoa. meetings and events without breaking the bank. 120-plus with help from Entrees Made Easy's new catering service. 25-year anniversary," says Marsha Bechtold, Therapeutic Associates. was awesome. It's a good value." serves the group and cleans up the mess. and we got 120-plus. Entrees Made Easy really came through in a pinch,"
prepared on the spot, and got good reviews from members." of the food and service first-hand. everything, it was very reasonable and the food was great." For pricing and menus, call Entrees Made Easy at 317-4159. Thanks Michelle Sobala at Organic Webs for helping me move past talking about setting up a blog, and actually getting it up and running.